We had an amazing break in our winter weather last week that made me SO ready for Spring! Our winter weather arrived late (February!) but hit HARD; as did my cabin fever. Putting out the Spring and Easter product in my booths at Stars has really got me in the mood for ‘play outside weather’. Some cute vintage chicks and bunnies. Ostrich sized faux eggs covered with vintage buttons. Milk glass is great for using with your spring decor! Vintage bell jars with hand shredded vintage book page ‘grass’ and gold leaf eggs. Custom blend of pink and gold paper shred to go with the packaged gold leaf and pink little eggs in the pink basket on the right. Turquoise glitter eggs too. More unique eggs for your spring display. These are covered with ‘Paris’ themed paper. Hand stitched felt eggs, embellished with vintage buttons and baby rick rack. Gallon size mercantile jars filled with moss, nests and eggs. Smaller jars with straw and eggs. Big vase with nest and eggs under black wire cloche. Cute mini take out boxes in Spring colors are perfect for filling with sweets to give to your friends at Easter Brunch. Decorative faux cupcakes. Plenty of cake and cupcake stands. These are so versatile for use in your seasonal tablescapes for adding height and dimension. Reproduction vintage style chicks from an estate sale. I gave them lace crowns and nestled them into some cozy nests. Hand painted faux eggs in turquoise ceramic pots and buckets. LOTS of new frames, big and small, just stocked. LOVE this reproduction Gothic arched window pane. I’m still on the fence about selling it. It just might come home with me on my next trip! Vintage white shutter with handcrafted twiggy wreath. Youth size white rocking chair. Vintage wash bowl and pitcher. One of a kind little upcycled suitcase end table with ‘hairpin’ metal legs. Black occasional tables. The bottom one is distressed oak, the top one with the scalloped apron and curvy legs is a satin finish. Will be removing all the darker furniture in the not too distant future; replacing it with lighter colors for Spring and Summer. Not quite matching pair of vintage canning jar lamps. The jars are the same size but different brands. The shades are the same color, but slightly different shapes. Each sold separately; $29.00. Vintage jewelry box with seashell motif paper. Assorted crates and carriers; perfect for use with your spring decor. Stars is open seven days a week; 11am – 6pm. Christmas is less than a week away! WhaaaaaaaaaaaaaaaaaaaaaaaaaaaaaaaaTTT?!?! How is it that even though Thanksgiving was early this year, basically giving us an extra WEEK between then and Christmas; that Christmas has still snuck up on me?!?! I have not even started wrapping gift yet! sigh. And to further ZAP my Christmas spirit, I have to go to Costco tomorrow . . . because I use their pharmacy for my prescriptions. Ug! So to give my Christmas spirit a little boost and add a bit more “JOY” to my life; I’ve decided to put all my remailing Christmas product on sale for HALF PRICE, in my booth at Stars. Many other vendors are offering discounts on their Christmas product too. Instead of settling for the ‘slim pickins’ left over in the big box stores, come shop at Stars for unique vintage and upcycled gifts that they will really LOVE! Still a great selection of gifts, decor and gift boxes in both of my spaces. Show off your favorite Christmas treasures by topping them with a glass cloche. Unique and collectible gift boxes. I found some ‘itty bitty glass baubles’; just the right size for decorating your bottle brush trees! Hand crafted vintage sheet music and crepe paper rosette ornaments or package toppers; regular price $1.50 – $2.00 . . . NOW HALF OFF! 11AM to 6PM ALL OTHER DAYS! Took the rest of my Christmas goods to Stars this week. Both of my spaces are fuller than full! Plenty of vintage white Ironstone dishes in my wall space. Unique hand crafted gift boxes, perfect for that ‘little gift’ or gift cards. Hand painted Christmas signs, red glass jar lanterns come with a battery votive and SO CUTE little vintage style car with tree on top ornaments. Trees. Trees and MORE trees! Bottle brush trees in just about every size and color; mounted on unique vintage bases: candle holders, tart tins, glass vials filled with ‘snow’, spools of thread and cherub candle holders! ‘Snowfolk’ made from vintage salt and pepper shakers are making an encore appearance this year; but it will be their final year. Get them while you can. Bottle brush trees and snowmen are the perfect winter decorations to leave out after Christmas and before you decorate for Valentine’s Day. Vintage crepe paper rosette ornaments also make wonderful package toppers. Vintage sheet music rosette ornaments with classic Christmas color adornments of red, gold and silver. Both Stars malls are open 7 days a week; 11am – 6pm. Give unique vintage and upcycled gifts this Christmas. I’m FINALLY going to do it!! I have been wanting to do this for YEARS, and it’s finally coming to fruition. When I moved 3+ years ago, I was hoping to find a place big enough to have an occasional craft sale in. Alas, a place that big just wasn’t in my budget. Then I considered ‘making do’ with what I had and just ‘moving things around’ a bit to MAKE room to do a little craft sale. Alas and alack, I just had TOO MUCH STUFF (my collected treasures) and no place to move them to! Since moving I’ve continued to pare down my superfluous stuff and re-organize how I store my supplies . . . and I am finally to the point that I have room to do a little craft sale here in my home!! woo~hoo!! It has taken me the better part of a week to un-decorate my living room and find spots to stash decor items to make room for the stuff I want to sell. But I did IT. Now I’m just ‘tweaking things’ and working on how to display them. December 2nd from noon – 3pm. Since you’ll be buying directly from me instead of a mall or show where I have to pay rent, registration and/or consignment fees; I can sell it at HALF OFF! Everything $5.00 and up will be 50% 0ff. Enjoy some fresh baked Christmas cookies while you shop WITHOUT any crowds or cranky cashiers! Please B.Y.O.B. – Bring your own BAG if you have a reusable shopping bag. The thing I miss the most about no longer having our store is getting to see my friends and customers. I really hope you’ll stop by and say hi and grab a cookie or two while you ‘shop local’ and get some unique gifts and Christmas decor at crazy good prices. These are just a few pictures of what I have set up thus far. I’ll post more pictures on Friday. . . . . Thanksgiving, the Christmas will be here before you know it. I’m getting a head start and brought in a few holiday decor things to my booth at Stars this week. Then tomorrow I deliver to the ‘Every Husband’s Nightmare’ show in Hillsboro. After that show ends next Saturday, I’ll have even MORE holiday goodies to bring to Stars. I think my decorating theme for this year is ‘simple elegance’. Lots of pretty vintage glass baubles in jars and bowls with mini fairy lights give off a truly magical glow! It’s almost impossible to truly capture the beauty of the little lights in pictures and in the well lit store; but you get the idea. Some of these arrangements are ‘all inclusive’ pieces, where I have priced the container with the lights and baubles to be sold together as one item. The rest of them are priced individually so you can just buy what you need. If you already have the glass baubles and just need the container to put them in, OR if you have the container and just need a few more glass baubles. SO many different ways to display these holiday lovelies. Think outside the box and use what you have to place your ornaments in. Or buy something that will serve multiple purposes. This is actually a cupcake stand! Pretty little boxes with bows always add a festive touch to your decor, and you’ll have a gift box handy if you need one for a last minute gift! I’m pretty sure that the white metal stand filled with ornaments was intended for this very purpose. But you could also use it at Easter to hold your colored eggs. Milk glass punch and candy bowls look pretty filled with ornaments too! You can even fill the dome lid of your cake stand with baubles! It’s a bit of a tricky process and you have to be sure that no one inadvertently takes the lid off ‘to see what will happen’. A mess. A mess will happen. Which is why I didn’t fill the ones in my booth with glass baubles! I’ve got some awesome vintage crystal snack plates with cups for you holiday entertaining. And some beautiful silver espresso cups and saucers. There is never a shortage of Milk Glass dishes or vases in my booth! The milk glass vases are really pretty with vintage glass baubles on top of them too! Always a plentiful supply and variety of stoneware dishes too. Be sure you have all the serving bowls and platters you will need for serving your holiday feast. I hate to admit it, but my wall space become more of a depository for ‘all the stuff I can’t fit into my big booth’, as opposed to a theme planned vignette. A few bits of fall still available in my wall space. Stop on by and get into the holiday spirit. Stars is open 7 days a week; 11am – 6pm. Carload of reclaimed fence boards. Visiting one of my very best friends this last summer, and returned home with this! LOTS of mossy grey weathered cedar fence boards. I was literally GIDDY with ideas and possibilities of what I was going to make with these beauties. My first project was some simple signs, using laser cut metal words glued to a piece of the natural weathered wood. A few of them have gone to my wall space at Stars. The rest of them will be going to the upcoming fall show at the Washington County Fairgrounds in Mid-November. Next I decided to try my hand at making some BIG rustic Farmhouse style trays. This one is the prototype. LOVE these super long wrought iron handles. They were an estate sale find, and unfortunately a ‘one time find’. Well, I probably COULD find more like them if I really searched on-line, but they would probably be cost prohibitive for me to use on my trays. I’ll have to find some other handles that will work. Then I went on to make three more; one of which is an EXTRA long 38″. The other two are 24″ and 25″ long; all are 11.5″ wide and just under 4″ deep. I have taken ALL of these to my booth at Stars for the time being. If I don’t get more of them built before the fall show, I may pull a couple from Stars to take to the show. Priced $37.00 – 59.00. On the extra long tray I used the ‘beefy’ black metal handles. On the other two, slightly smaller black handles, on the sides of one tray and on the top sides of the other. I’ve only made one of these little stools thus far. It’s 11″ x 6″ x 5″. I’ll probably make another batch of them a little later; graduated stacking sizes. This stool has gone to my wall space at Stars. $10.00. I saw the idea for reclaimed wood shutters on Pinterest. Adding the removable little boxwood wreaths with the metal words and red truck ornament is my own idea. Making the embellishments removable makes it easier for the buyer to use them to decorate with year round, instead of having to pack them away after the holidays. 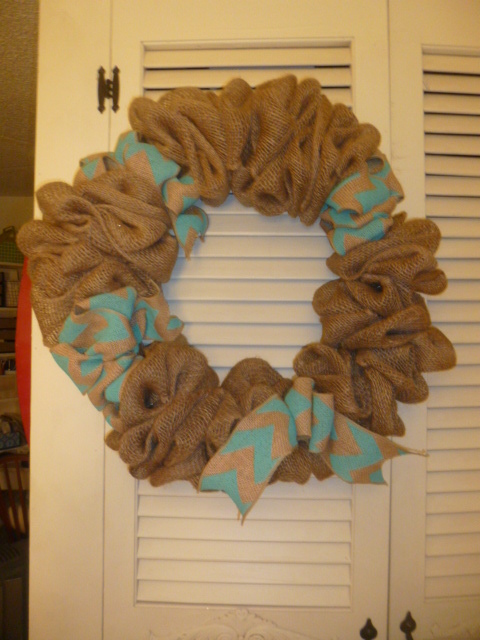 $29.00 with the wreaths. Decorating with arrows is very popular right now. I made assorted shapes and sizes of wood arrows with hangers on the back to hang on the wall. I made a couple dozen of these. They will be going to the fall show. Priced $5 – 14.00. This is my take on something ‘somewhat similar’ that I saw on Pinterest. They measure 12″ x 13″; and will be going to my booth at Stars and to the fall show. $29.00. I forgot my camera last week, so I didn’t get pictures of all of these items in my booth. I am SO ready for spring sunshine! We had a couple of sunny ‘teaser days’ in January, and a gorgeous sunny and warm weekend last weekend . . . . the rest of the time . . . rain . . . and MORE rain! sigh. Spring. Spring. Where art thou? Although we haven’t had much in the way of spring weather thus far, I have been diligently working on new spring inventory; for my booth at Stars and the upcoming “Every Husband’s Nightmare Bazaar” in April. Here’s a sneak peek at what I’ve been working on. I’m really liking neutral tones this year. And big jars of stuff. Dried hydrangea, dried white pepper berries, assorted dried botanicals and assorted shells. Jars of spools and balls of yarns and BIG vintage spools of neutral color yarns. And nests with eggs . . . . this set of three eggs with wood base and cloche top will be sold as a set. Natural moss, bark and twigs (from my yard!) in a vintage apothecary jar with a little nest. Big mercantile jar with lid and three nests; being sold as a set. It’s hard to tell from the pictures, but this jar also has three nests in it, each facing a different direction in the jar; moss on top of all the nests. Small vintage bell jars with moss, nests, eggs and twigs. Another ‘beach scape’ jar. This jar is an old fish bowl. This lid was from a big 2 gallon glass jar that I BROKE at my last show. I decided to hang on to the lid, ‘just in case’ I came across another such jar when I’m out thrifting that was missing a lid. Turned out, it fit this fish bowl perfectly. The little sand castle was just a white plaster one that I covered with sand. Just nests. To give them a little ‘oomph’, I glued them to a big piece of bark. Tied a little ‘nest’ tag onto some of them; added feathers to some. More ‘just nests’. These with super tiny speckled eggs. See the comparison photo with the nest on bark for egg size. Assorted vintage containers with various eggs and nests. The eggs in the tallest jar are ‘chicken egg’ size. More of what I call the ‘mercantile’ jars; this time with bigger nests and ‘chicken’ size eggs in them; ‘nest’ tags and vintage keys tied to the lids. Finally ran out of nests and had to start just using the assorted mosses and excelsior that I had on hand for fluff. Assorted vintage jars with moss and eggs. I GLUED the eggs to the moss to prevent then from ‘disappearing’. Using up whatever containers I happen to have on hand for the eggs and nests. These metal candle stands were perfect ‘little nest’ size! The darker nest is a ‘purchased pre-made’ nest; the other, a hand-made moss one. I don’t remember where I got these cute little canning style jars, but they were perfect for a tuft of moss and three little eggs. LOVE these little apothecary style jars. They are TINY. Barely big enough for 2 of the tiny eggs. I don’t even know what the original use for these metal tins is?!?! I used to always use them for grubby primitive candles and ‘fixins’. had a few leftover from my primitive days and decided to put nests in them. These pictures show a good size comparison of the small vs. chicken size eggs. For those whom already have containers or cloches and just want to buy the nest, I did a few even without the added bark. The larger white eggs in this picture are plastic eggs that came in the nests when i bought them. The other eggs are ‘styrofoamish’ stuff that I hand painted. All eggs are glued in place. I had a LOT of eggs to use up! I had saved these glass baby food jars from buying baby food meat to make dog biscuits for my grand-puppy. Spray painted the lids and printed up little ‘specimen #’ tags to glue onto the jars. Placed one tiny egg and a pinch of moss in each one. Will be taking some of this to Stars tomorrow. MORE to Stars next week . . . along with a BIG SPECIAL ANNOUNCEMENT. And the rest to the spring show April 23rd. I’m really drawn to galvanized metal items and soft grey colors these days. I especially LOVE the contrast of mixing them in with shabby chic white decor. I’ll be bringing LOTS of items in this color to the upcoming Rebel Junk Vintage Market on February 2&3. In addition to the ‘real thing’ (all of those items are already packed away for the show) I’ll have lots of faux painted items, like the ones shown above. I’ve also got some distressed turquoise metal items, shown above. For some reason, I decided to buy some dark turquoise spray paint a while back; and I painted these items with it. Did not like it once they were painted though, so they have just sat in storage. Got them out and was going to sand them to prep them for repainting, but decided that I actually LIKED the distressed dark turquoise! Come visit my booth, and don’t forget to ASK for your 20% discount. Discount given ONLY to those who have read about the show via my blog and/or Facebook page; and only if you ask. My booth only. 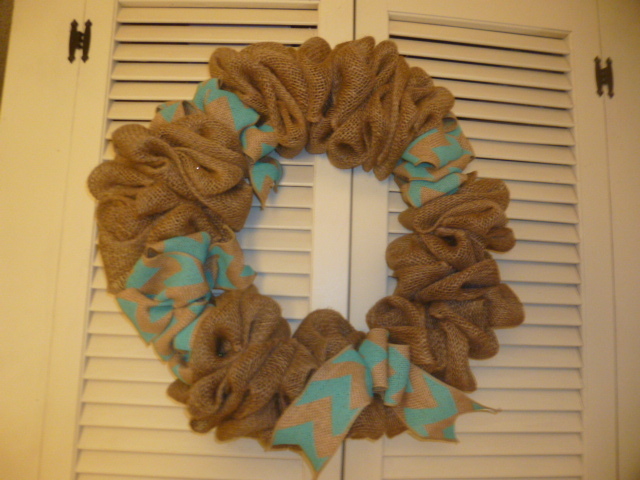 I LOVE the ‘loose & fluffy’ look of burlap wreaths! I’ve been ‘intending’ to make one ever since they first started popping up a few years ago. And I’ve accumulated all the supplies, over the years, to do so! I even ‘did the research’ (looking on Pinterest!) for tutorials. And THAT is as far as I got before discouragement set in and my supplies were left to gather yet another layer of dust. Do you love/hate Pinterest as much as I do?? Love all the ideas and inspiration, but HATE all the DIFFERENT tutorials for making the same thing! aaaaarghhhh!!! 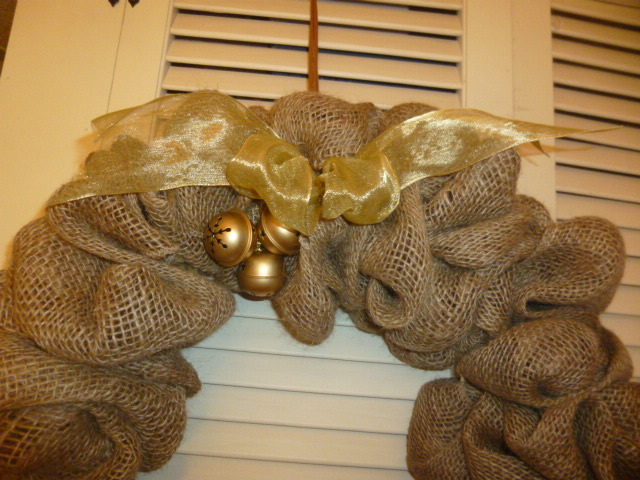 In my burlap research I found tutorials that said to use pipe cleaners, to attach your burlap to your wreath form. Another said to use zip ties. Another wire. Even one that said to use SCOTCH TAPE?!?!? So, after all that ‘research’ and the subsequent complete confusion, I just went with what ‘sounded’ most logical to me. Pipe cleaners, cut into 1/4’s, Wire cuts up your hands too much and scotch tape, just NO! So, this is how my first attempt turned out. And even with having pre-cut all my pipe cleaners to length, it took me a good TWO hours to complete this baby. And I really was not totally happy with it. I wanted more ‘fluffed out’ areas. All the folds were just laying too FLAT. I tried ‘hand fluffing’ them, but they just flattened right back out. So I grabbed a roll of brown package wrapping paper and made some ‘wads’ of it and stuffed them into various places. You can see a few of them in the above close-up photo. THAT is how I imagined it would look! And it breaks up the folds a bit, and looks more ‘random’ to me. So I waded up a bunch more paper balls. Here you can see a few more of the places where I added the paper. But you really don’t notice it if you don’t know it’s there. I think perhaps my ‘problem’ with not being able to ‘fluff my folds’ without adding something is that the burlap I used was only 5″ wide. 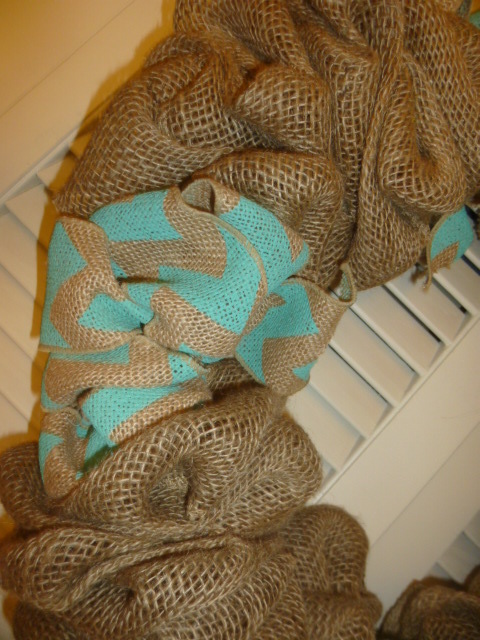 Wider burlap, folded in half, would probably fluff better. SO, after I made that first one, I ventured back to Pinterest to look over some more tutorials to see if there was a FASTER way to make them. Can’t make any money selling them if it’s gonna take me over TWO hours to make one!! 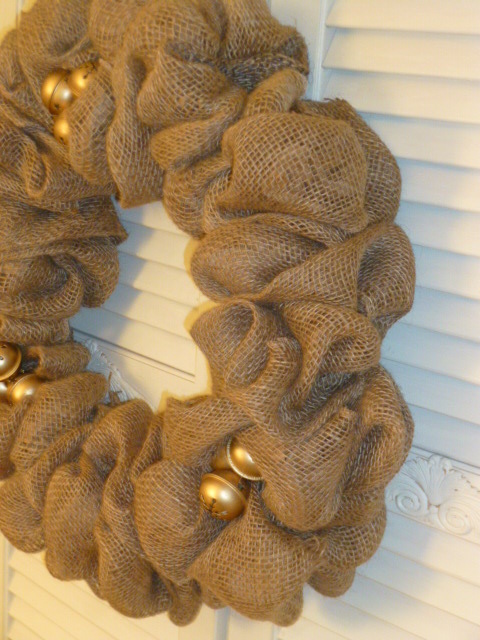 Interesting, and most definitely a FASTER way to make a burlap wreath, but personally, I would NEVER make on using that method. Not even just to keep for myself. Why? One snag and your entire wreath will come apart! 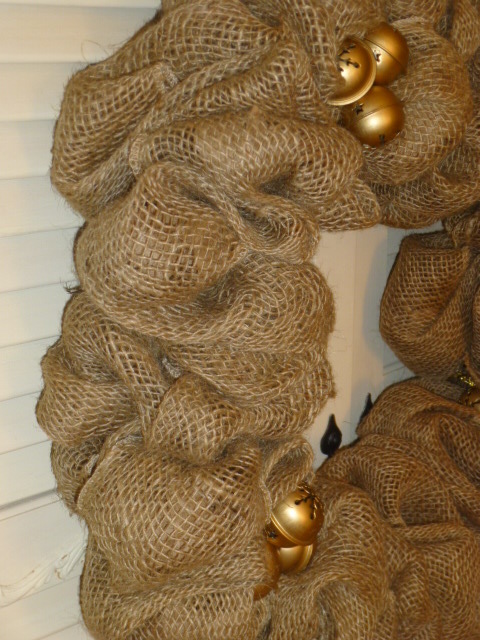 There is nothing ATTACHING the burlap to the wreath form. No thank you. I’ll stick with my more labor intensive, but PERMANENT method; and only make a very FEW of them. This is the back of the one with the gold bells. 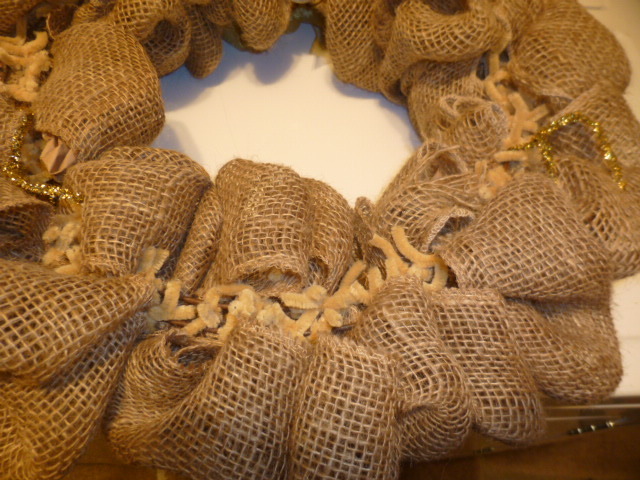 Each ‘loop’ of burlap is secured to the wreath form with a cut piece of twisted pipe cleaner. 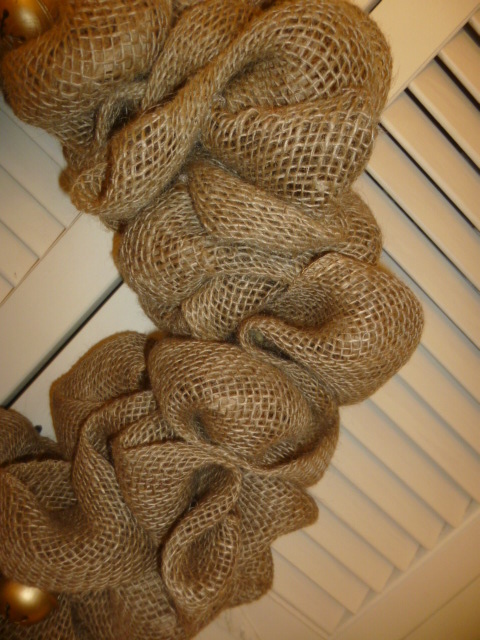 This is my second one, on which I used some printed burlap ribbon interspersed. The printed ribbon was wired and fluffed out nicely. 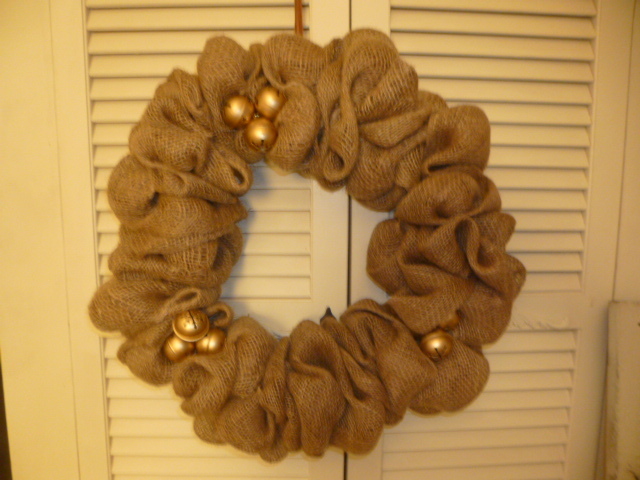 I did NOT add the brown paper to fluff out the rest of this wreath . . .yet. Still pondering whether or not I need to. I used MORE burlap on this one, so it’s fuller, and I guess with the printed ribbon ‘breaking it up’, the layers of burlap with no fluff don’t bother me as much. Which do you prefer? The larger ‘fluffs’ or the one with more ‘folds’? I really don’t have a ‘favorite’. Each looks good to me in its own way. I decided to embellish the first one with a gold bow and a gold glitter “Noel” ornament. I just ‘hung’ the Noel over one of the burlap loops, and did NOT permanently attach it. That way it can easily be removed, and the wreath can still be used beyond the Christmas season. Forgot to show you what kind of ‘form’ I used for these. I bought this batch of rusty metal wreath forms at a garage sale a long time ago. To prevent the rust from ‘shedding’ onto the wreath, I spray painted them with clear spray. And I sprayed one white for an up[coming project. 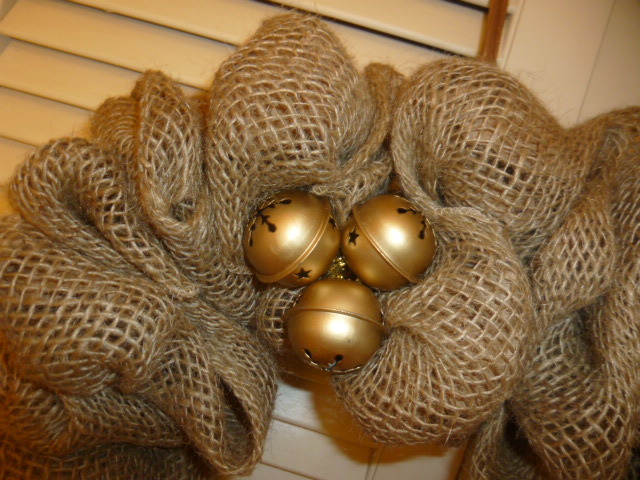 AFTER I made those two burlap wreaths, I found these wire wreath forms at DOLLAR TREE! 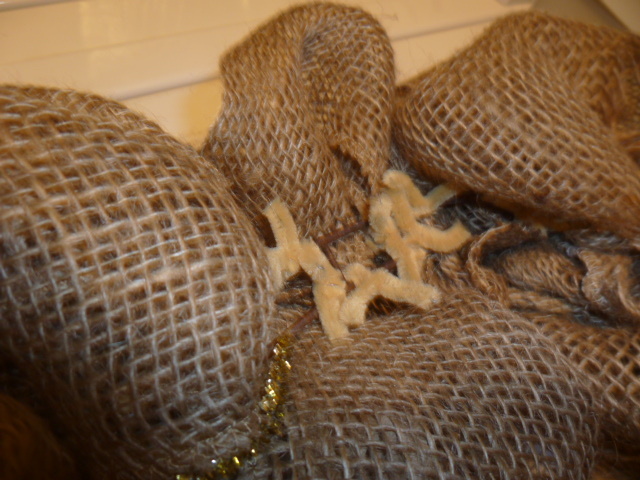 These are the kind used in the video, twist and tuck method, and should make for a fuller wreath. I haven’t used them yet, and in fact, I still have several of the rusty ones left. But I did buy a few of the Dollar Tree ones because I KNOW that if I don’t buy it when I see it . . .they’ll be gone when I DO need them! This one has gone to my booth at Stars. Still trying to decide if the other one ‘needs something more’. Will probably save it for spring. It’s hanging on my re-done ‘holiday wall’. Here’s a closer look at some of the other holiday wall decor items. Bought these little gold frames at the bazaar last week. The ‘Merry Christmas’ ornament is just ‘tied on’ with ribbon and can be removed so the frame can be otherwise used.